Osaka, here we come! 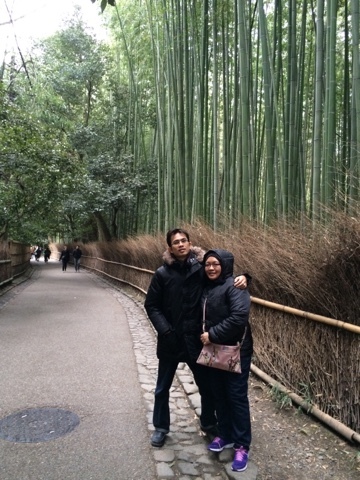 - Bercanda di Kyoto dan Romantika di Arashiyama! Our trip to Japan has now entered Day #5! How time flew! 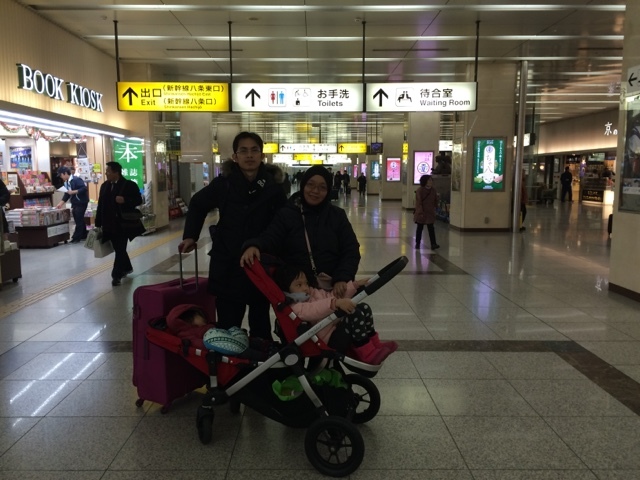 After 4 days in Fukui, it was time for us to go back to Osaka. We left my sister's place around 6.30am since we had to catch a train at 7-ish. I think. I can't remember, LOL. All I remember was staying up to pack our stuffs. To make it easier, I packed our smaller cabin size luggage in our bigger luggage so we could store the bags in just one locker once we reached Kyoto (by the way, we spent the day at Kyoto first before exploring Osaka city centre). Plus, it's easier to pull one luggage around rather than two luggages! I was super excited because that morning, we were going to have our first ever Shinkansen ride! Woohoo! But first, we had to board the Thunderbird Limited Express (which took almost 2 hours, of which Khadeeja spent the ride comfortably catching on her sleep in her stroller seat which I placed on the floor at my feet) to Shin-Osaka and then board the Tokaido Shinkansen (which was about 15 minutes' ride). I was in awe when the Shinkansen arrived at the platform because I didn't think it would be that loooonggg! Actually, we were supposed to board somewhere way in front at the non-reserved seating carriage, but since it would only take 15 minutes, we simply boarded the reserved seating area, next to the first class area. We could have just sit in any of those seats since there were plenty of empty seats available but segan lah pulak. Hehe. 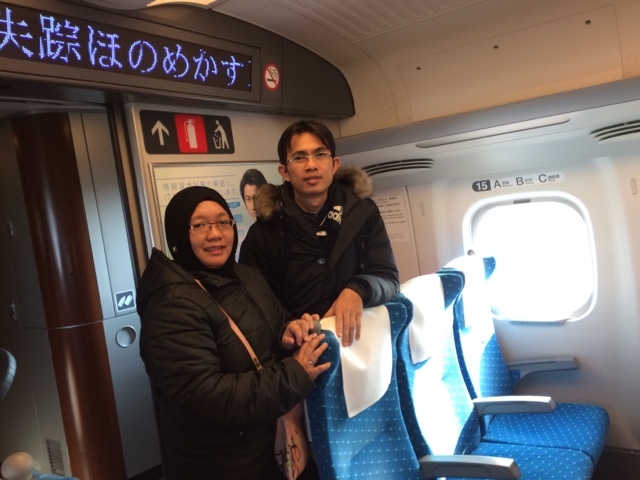 Once on the Shinkansen, I didn't exactly feel any different than riding on ERL for example. Only that we reached Kyoto in just 15 minutes compared to maybe, an hour and a half ride by normal train? The first thing we did when we reached Kyoto was to look for lockers to store our bags. It costed us around ¥600 since our luggage is pretty big. Then we were off to our first destination! 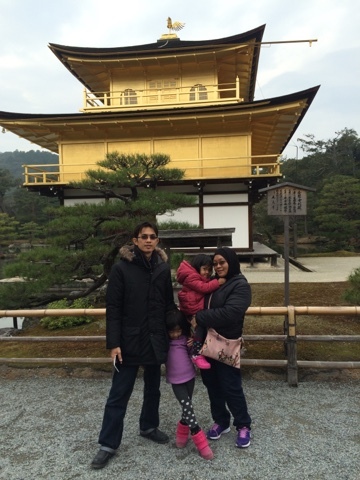 Kinkakuji is a famous zen temple in Kyoto, because of its pavillion which is completely covered by gold leaf. That is to show you how super rich those wealthy elite were during those times. To access this pavillion (and the garden beyond it), visitors have to pay ¥400 admission fee. Before we entered, a monk told us that there are stairs further up the garden and if we didn't want to carry our stroller up the stairs, we could turn back and exit from the entrance. In the end, we decided to dismantle our stroller and just climb the stairs since we were almost at the end of our journey here anyway, rather than turn around and walk back to the entrance. See the structure behind us? That is the famed golden pavillion, which was once upon a time, belonged to a shogun who built it for his retirement villa. Before he died though, he turned it into a zen temple. There is also a really huge lake surrounding the area and we could see koi fishes swimming about in the lake. The rest of the garden is well, like a zen garden - complete with the sounds of trickling waterfall and fresh air abundant. I could picture a monk meditating on one of the bench under the bamboo tree while listening to the sounds of moving water. 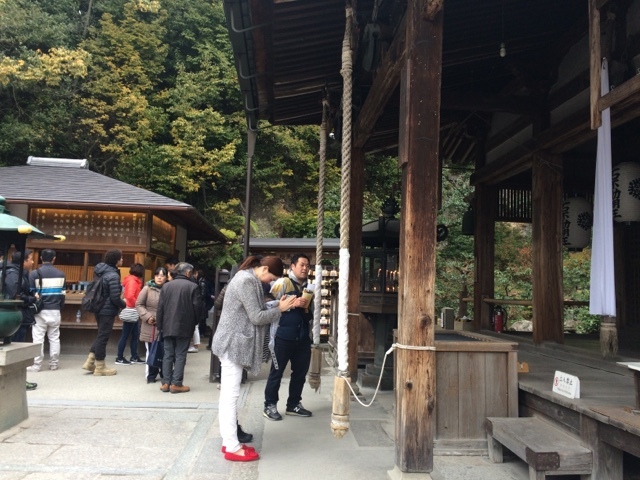 For Japanese visitors, their reason to come here is also to pray (New Year, remember?) at Fudo Hall, in front of the statue of Fudo Myoo, one of the Five Wisdom Kings. Before we left Kinkakuji, we bought a few packets of peanuts, with chocolate and wasabi flavors. We were rather famished by then since we didn't have our breakfast yet and it was already lunch time. The wasabi one was quite delicious. Once again, we took a taxi to the nearest train station to go to our next destination. 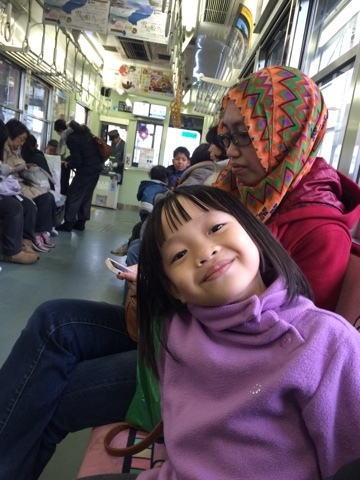 Khayla smiling happily because she got to pick pink seats in the train! I first came across a picture of Arashiyama Bamboo Grove on a kids' puzzle games on my iPad. 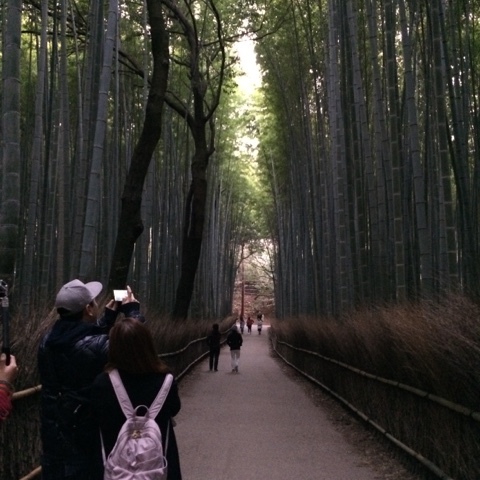 I was really amazed by the picture of bamboos growing neatly side by side and the path going on endlessly. It never crossed my mind that I would visit that place. 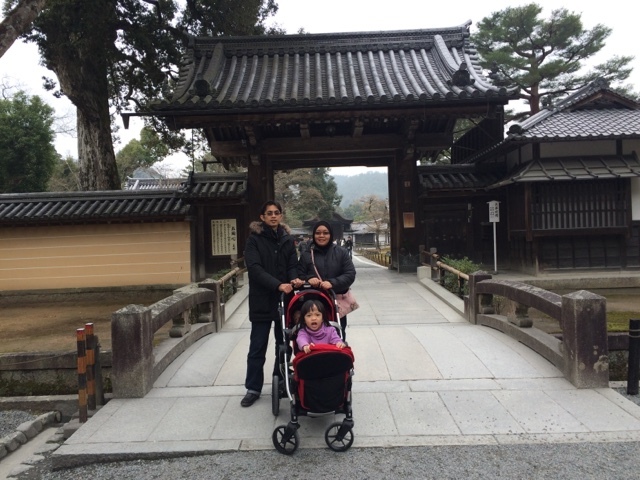 We took the Hankyu line and had to walk for a bit, crossing the Togetsukyo Bridge (the "Moon Crossing Bridge", another iconic landmark in Arashiyama) and passing streets lined with shops in central Arashiyama. 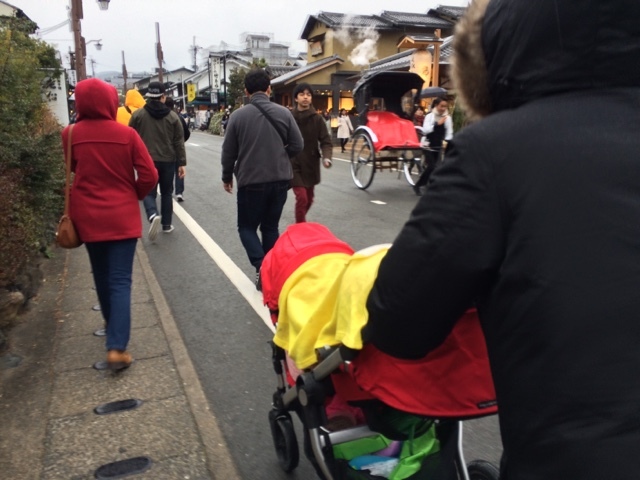 It started to drizzle along the way so we turned the stroller seats to face each other (with both girls already fast asleep inside) and draped a waterproof blanket between the two seats to cover them from the rain. And then suddenly, we were there! 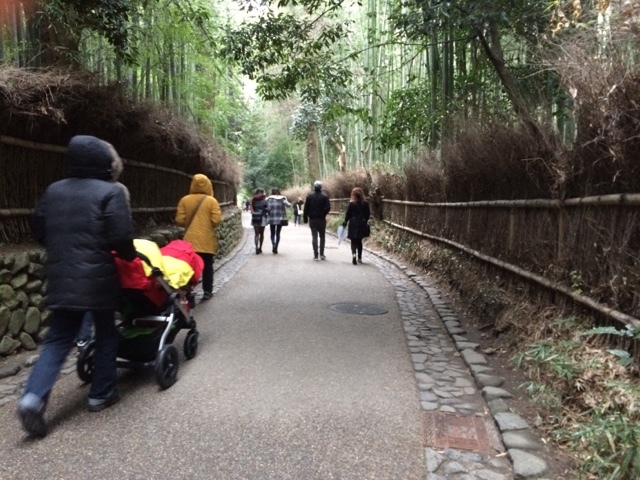 Despite feeling out of breath because we had to push the stroller uphill, we were thrilled and awed by the sight of the bamboo groves right in front of our eyes. How serene it was to listen to the rustling of the bamboo leaves and generally, the whole experience left us exhilarated and amazed at the same time! I wouldn't mind visiting this place again, but perhaps next time, it would be just the two of us, having our romantic stroll along the path lined with bamboo trees swaying gently in the wind. 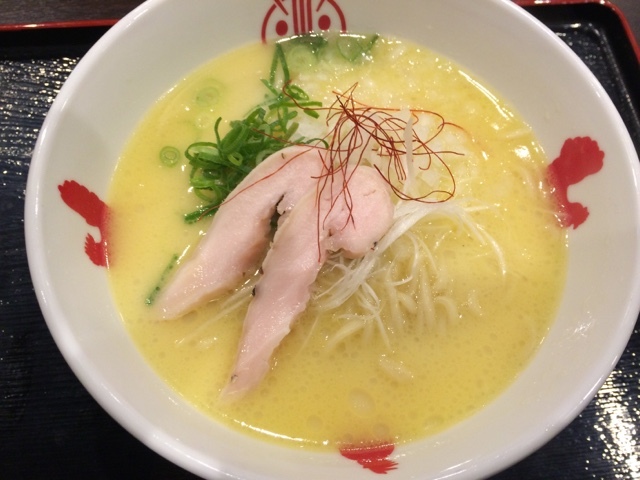 Before we headed back to our rented apartment that night, we stopped by Ayam-Ya, a halal ramen shop. It was good to know that halal food is not difficult to find in Japan, not only because they served halal food, but also because they also provide a place for Muslims to pray. Ordering food at this restaurant is quite unique compared to other places we've been to. At the entrance, there is a ticketing machine, which required us to press buttons to order the meal we wanted and then inserted coins / notes to pay for the food. We arrived at the restaurant about 10 minutes earlier and had to wait outside in the cold. 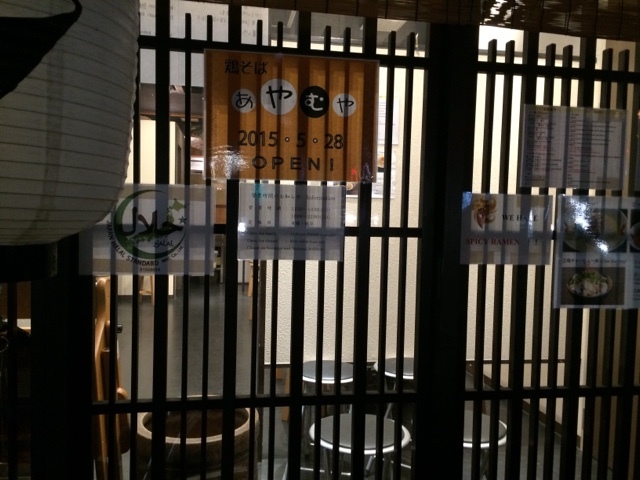 Talk about highly punctual Japanese culture! Then it was time to go and find our apartment. 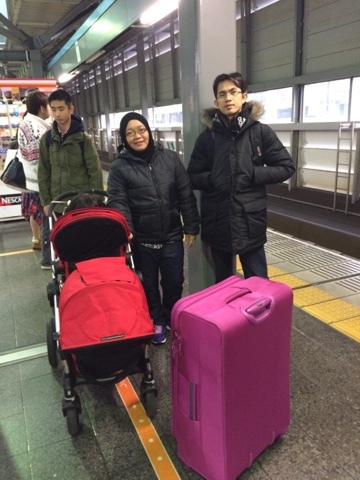 First, we had to go back to Kyoto Station, retrieved our luggage and then walked across the station to get to our subway. Then around 10 minutes walk (uphill! with a really big luggage and a really heavy stroller to push!) before we reached the apartment. When we arrived, a delivery guy was waiting outside the door looking bored but he was very polite as my sister apologized profusely to him for keeping him waiting. Turned out he was delivering our bento food supplies for the next 2 days - full of Malaysian food, thank heavens! Will blog about our apartment which we booked through Airbnb in a separate post. 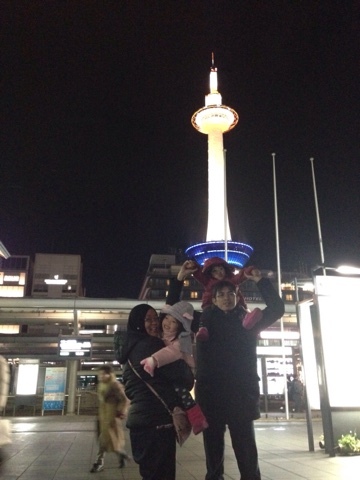 Next entry will be about our Osaka sightseeing trip - to Kaiyukan, Osaka Castle and Dotonbori area. Stay tuned!